Emmanuel Reformed Church was started in 1852 when the original building was erected in Castleton. 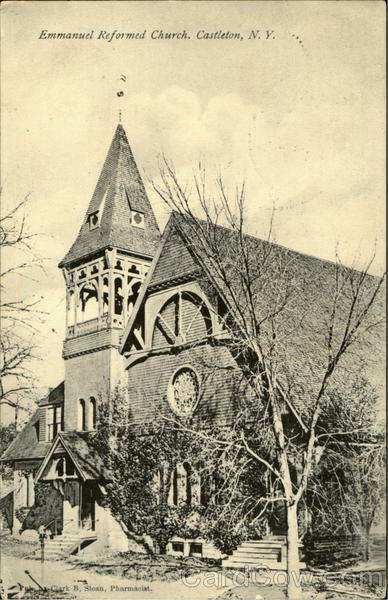 That structure served as home for the congregation for over thirty years, replaced in 1886 by a grand building on the north end of Main Street in Castleton-on-Hudson. There are still some within our congregation that remember our Main Street home that was a landmark in the community through 1967. On July 19, 1967, ground breaking was initiated on Maple Hill Road site. The building which is now our Fellowship Hall and classrooms was dedicated less than a year later, and used as the new site for our worship. It was the first step in a vision to develop facilities which will enable the ministry of Jesus Christ in the Castleton community. The current Sanctuary was completed in 1973 . The next phase of construction included the new entrance, office space, and meeting room, and was completed in 1991. In 2017 the ground was broken again as members worked together to build the new ministry pavilion. While we are a historic church, the process of moving and rebuilding set the congregation on a pathway that recognizes the importance of the past, but sees vitality in striving for the future. The blend of old and new, change and tradition, history and vision uniquely equips ERC to minister to the people of Schodack and the surrounding area. We invite and welcome all to join us in seeking to be a congregation of God's people who together are a church seeking to follow Jesus Christ. A common question is about the word "Reformed" in our name. Reformed from what? We are a Christian church, of the Reformed tradition. The word Reformed comes from the Protestant Reformation which swept across Europe in the 1500's under the leadership of such men as Marin Luther and John Calvin, who did not want to break with the church, but rather Re-form it so that it would be more faithful the Bible and ultimately to Christ. To be Reformed is to make a commitment to putting Christ first. With the Holy Scriptures as the ultimate rule of faith and practice by which we are to pattern our lives, we proclaim the gospel of Jesus Christ, depending on Him and each other to do the will of our Lord and Savior. We are saved by faith, not by what we do. Come and join us on Sunday mornings at 9:30 a.m. for our time of worship. Our worship is a blend of traditional and contemporary music set within the Reformed Church in America (RCA) liturgy. Learn more about what to expect when you visit on Sunday.